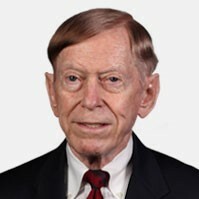 Baylor>Psychology & Neuroscience>About>Faculty & Staff Directory>Roger E. Kirk, Ph.D.
Roger E. Kirk is a Distinguished Professor of Psychology and Statistics. Prior to joining the faculty at Baylor University he was the Senior Psychoacoustical Engineer at the Baldwin Piano and Organ Company in Cincinnati, Ohio. Dr. Kirk is a fellow of the American Psychological Association (Divisions 1, 2, 5, and 13), the American Psychological Society, and the American Educational Research Association. He is a past president of the Society for Applied Multivariate Research, Division 5 of the American Psychological Association, and the Southwestern Psychological Association. In recognition of his teaching effectiveness, he was named the Outstanding Tenured Teacher in the College of Arts and Sciences and designated a Master Teacher, Baylor University's highest teaching honor. He is the 2005 recipient of the American Psychological Association's Jacob Cohen Award for Distinguished Contributions to Teaching and Mentoring. He and his wife are avid ballroom dancers. They enjoy participating in ballroom dance competitions and doing dance demonstrations. Dr. Kirk's research interests include the application of the cell means model to the analysis of variance and covariance designs and the exploration of factors related to the success of students in introductory statistics. Kirk, R. E. (2010). Latin square. In I. B. Weiner & W. E. Craighead (Eds. ), Corsini encyclopedia of psychology (4th ed. ), (Vol. 2, pp. 915-917). New York: Wiley. Kirk, R. E. (2010). ABA and ABAB designs. In I. B. Weiner & W. E. Craighead (Eds. ), Corsini encyclopedia of psychology (4th ed. ), (Vol. 1, p. 1). New York: Wiley. Kirk, R. E. (2010). Block designs. In N. Salkind (Ed. ), Encyclopedia of research design (pp. 91-97). Thousand Oaks, CA: Sage. Kirk, R. E. (2010). Simple random sample. In M. Lovric (Ed. ), International encyclopedia of statistical sciences. New York, NY: Springer. Kirk, R. E. (2011). Outlier. In G. Ritzer & J. M. Ryan (Ed. ), (Concise encyclopedia of sociology. (p. 435). Oxford, United Kingdom: Wiley-Blackwell. Kirk, R. E. (2011). Experimental design. In G. Ritzer (Ed.). The Blackwell encyclopedia of sociology (pp. 208-209). Oxford, United Kingdom: Wiley-Blackwell. Kirk, R. E. (2012). Experimental design. In I.B. Weiner (Series Ed.) and J. Schinka & W. F. Velicer (Vol. Eds. ), Handbook of psychology: Vol. 2, Research methods in psychology (2nd ed.) (pp. 3-33). New York, NY: Wiley. Kirk, R. E. (2013). Experimental design: Procedures for the behavioral sciences(4th ed.). Thousand Oaks, CA: Sage. Kirk, R. E. (2015). Effect Size Measures. Wiley StatsRef: Statistics Reference Online.1-13. DOI: 10.1002/9781118445112.stat06242.pub2.